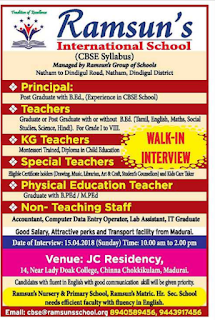 Ramsun's International School, Dindigul has advertised in The Hindu newspaper for recruitment of Teaching /Non teaching jobs vacancies. Interested and eligible job aspirants are requested to apply immediately. Check out further more details below. Name of the School: Ramsun's International School, Natham, Dindigul. About School:RAMSON MATRIC NATHAM was established in 1997 and it is managed by the Private Unaided Management. It is located in rural area . It is located in NATHAM block of DINDIGUL district of TAMIL NADU. The school consists of Grades from 1 to 10. The school is co-educational and it does not have an attached pre-primary section. The school is non-residential in nature and is not using school building as a shift-school. During the previous academic year; the school functioned for 210 days. It had 2 academic inspections and was not visited by the CRC and BRC Coordinators during the previous academic year. Â English is the medium of instructions in this school. This school is approachable by all weather road. In this school academic session starts in June.The school is approachable by all weather road.The school has implemented continuous & comprehensive evaluation (CCE).The school has a boundary wall.The school has got computer in the school and all are functional.The school has computer aided learning lab.Teachers of school are well qualified as they have graduate & above degrees.The teachers are professionally qualified.The school has a regular Head Master/Teacher.The school was inspected during the previous academic year.There are female teachers in the school.The school has got girls' toilet.The school has a comfortable Pupil-Teacher Ratio (PTR).The school needed ramp for disabled children to access classrooms and it is available. Handrails for ramp is also available. (a) Principal: Post-Graduate with B.Ed,(Experience in CBSE school). (c) KG Teachers: Montessori Trained,Diploma in child education. (d) Special Teachers:Eligible certificate holders. (e) PET: Graduate with B.PEd/M.PEd. 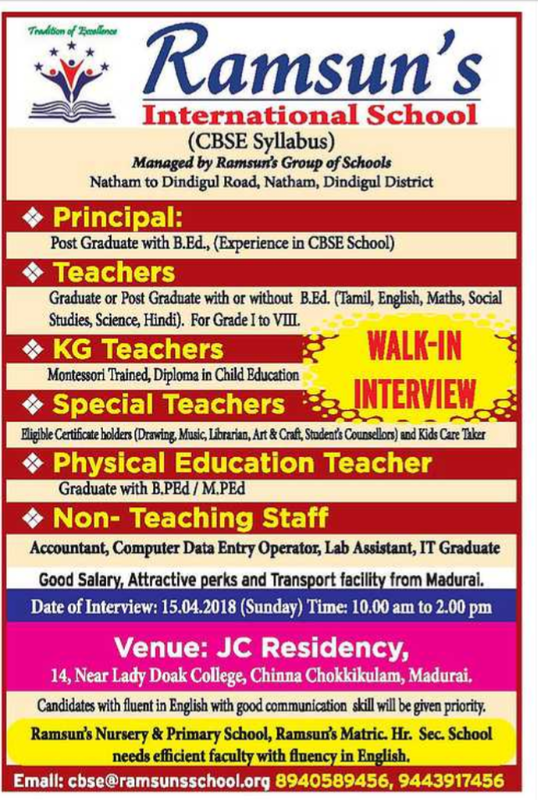 Good salary,Attractive perks,Transport facility from Madurai. Date of interview: 15-04-2018,sunday,time 10a.m to 2p.m. Venue: JC Residency,14,Near Lady Doak College,Chinna chokikulam,Madurai.